I never really considered myself a power user but as I sit in front of my Milan060 I am beginning to wonder. When I got the Milan I was more than happy with the great leap in performance above the STFM, besides there were too many other features to think about. Then I read Ingo Schmidt's web site and decided to fix the SCSI firmware and have a go at overclocking the motherboard from 25 MHz to 30 MHz. Thanks to Ingo it worked brilliantly and the extra 20% performance was noticeable and welcome. Alas this only whetted my appetite for even more speed. The next obvious step was a 68060 upgrade kit. I contacted Woller Systeme but they had none left so I asked Uwe Schneider if he had any. Fortunately he had some of the upgrade cards but he only had 68060 LC processors left. The LC has no floating point unit but it can still be used, however, I decided to order a full 68060 from Vernal Elm in the USA. The CPU arrived followed by the upgrade card and I thought I was only hours away from having a Milan060. The installation is very simple to anyone familiar with SIMM or TOS upgrades in an ST. The card includes a floppy disk containing the latest bootblock and TOS which must be flashed onto the ROMs before the adapter is fitted. Since getting my Milan there have been several improvements to the bootblock and TOS so I was familiar with this step. Next I fitted the 68060 into the socket on the adapter board and dismantled my tower case to gain access to the 68040. I very carefully levered the 68040 out of the motherboard and found that the CPU actually sits on a PCB not much bigger than itself. This board can be removed or left in place, I decided to remove it. The new 68060 adapter board is slightly larger and has a cut-out at one corner to avoid some components on the motherboard. It is fairly easy to align and insert into the socket on the motherboard. After making lots of checks and double checks I reconnected the Milan and switched on. There should have been a bleep, a quick flash of the keyboard LEDs and the monitor should have sprung into life. Instead, all I could see was the LED on the monitor flashing away. Clearly something was wrong. This began several weeks of checking, testing, cursing, unplugging and plugging, more cursing and lots of e-mails between Uwe and I, and several visits to the post office. I tried everything from removing as many PCI and ISA cards as possible to re-arranging the SIMMs, even disconnecting the CD drives. 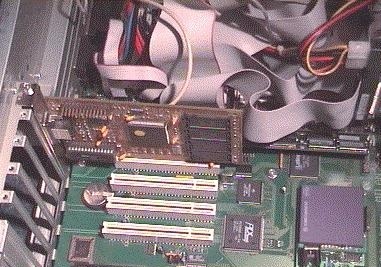 Eventually we decided the problem was that the 68060 wasn't fully seated in the adapter so I posted the kit and CPU to Germany and Uwe used an insertion tool and was able to check that all was well with the adapter. Once it was back here I tried it again in my machine only to have the same disappointing result. I repeated all of the tests and then we decided that the only option was to send the whole motherboard to Uwe with the adapter. Of course it worked perfectly for Uwe so he returned it. Next I borrowed some old Trio graphics cards and tried those. Still no luck so Uwe sent me a special card called a Power-On Self-Test (POST) card along with an ISA card that displays various status codes on a 7-segment display while the Milan is booting. I tried it with the 68040 to get an idea what should happen and noted the various status codes. When I installed the 68060 and booted up, nothing was displayed and this meant that the actual cause of all these woes was the PSU! 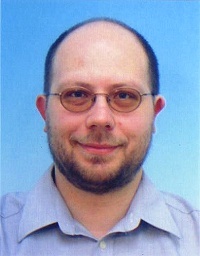 In Uwe's words, "We had problems with the initialisation of some S3 cards depending which power supply we used. After measuring the power-up ramp of the 5 V supply voltage we discovered that we had problems with the slow ones. With a slow power-up ramp the PLL of the VGA-card didn't swing. We fixed this in software for the VGA cards, but maybe there is another problem with the processor, which we didn't recognize until now." My understanding is that if the PSU doesn't power-up fast enough then the graphics card doesn't activate and the whole boot process stops. My solution was to salvage a PSU from a broken 486 machine and replace the one in my tower. What a nightmare and hopefully one that other users will not experience. The final step was to fit the 486 cooling fan onto the new CPU. The 68060 runs at twice the motherboard clock speed so some sort of heat sink is needed. The heat sink is interfaced with a small amount of thermal paste and attached with superglue at each corner. The original 68040 had plastic clips on the legs that allowed a small heat sink to be attached with a wire clip. Since I was planning on running the Milan at 30/60 MHz I thought the fan would be a good idea. More on this later. So what is the performance like? Well I didn't do many benchmarks with the two set-ups but I did run the Kronos tests. Processor/FPU functions are twice as fast as before and OpenGL is over 1.5 times faster, even VDI shows a slight improvement. In daily use everything seems faster apart from disk access. However, it is not just a case of doing the same things faster, the Milan060 can do things that the 040 could not do and Aniplayer is probably the best example of this. CD-quality MP3 music files were not playable on the 040, the sound used to jump like the needle was stuck (showing my age). Now they play at about 80-90% CPU load and usually only skip when another program accesses the hard disk. Even movie files with sound play quite well provided the image is not too large. Other CPU intensive tasks like displaying PDFs or large JPEGs benefit from the extra speed and I have very quickly become used to the speed, it's a bit like buying a faster car, after a few weeks you don't notice. Looking at the benchmarks, Hades 68060 owners are probably feeling quite happy but I am certainly not disappointed with the result and I am very happy that I chose to fit the upgrade. For anyone interested in becoming a Milan power user, Uwe Schneider still has some 68060 adapters available. "In 1989 some friends of mine and I founded a small company. We distributed Atari computers and some expansions (memory, hard drives, HD floppy drives and so on). In these years I learned a lot about the Atari hardware and toyed with the idea to create a new Atari. After college in 1996 I founded my own company and some time later during the Atari fair in Neuss we were sitting together by some beer and were talking again about a new Atari. I said it wouldn't be so difficult... and after a while Ali [Goukassian] said, "OK make it" and the Milan was born. I think it was the spirit of Atari which made this dream come true. We all had some other business to get our rent paid and this was good because the whole Milan project never paid off. But the joy of creating a new Atari was worth all the trouble." The main difference between the 040 and 060 for a hardware designer is the different core voltage. The 040 has 5 V and the 060 3.3 V. For compatibility reasons the 060 has the same power pins as the 040. That was the reason to make the two-PCB solution. The lower board is connected to the 5 V power supply pins and contains the low-drop regulator (6) for the 3.3 V, some capacitors (1) for filtering the power lines, the three diodes (2) for the power-up sequence of the 060 and an integrated circuit (3) for the different strapping options of the 060. 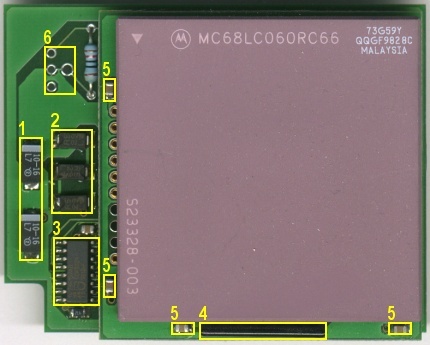 The upper board is connected to the 3.3 V power pins and contains the ceramic bypass capacitors (5) and the necessary pull-ups (4) to 3.3 V. The upper board gets its 3.3 V from the additional contacts on the left side of the CPU. All other pins besides the power and the strapping pins are connected directly through the precision contacts in the upper and the lower board. Thanks to Uwe Schneider for the technical information.